Wow… taking a look at all the amazing workshops I have been invited to for the month of April and it makes me giddy to see the shift in my community, to see so many healing venues available on a local level.  At Motherlode Holistic Wellness Center, we have several classes happening on site as well as team members offering off site.events. 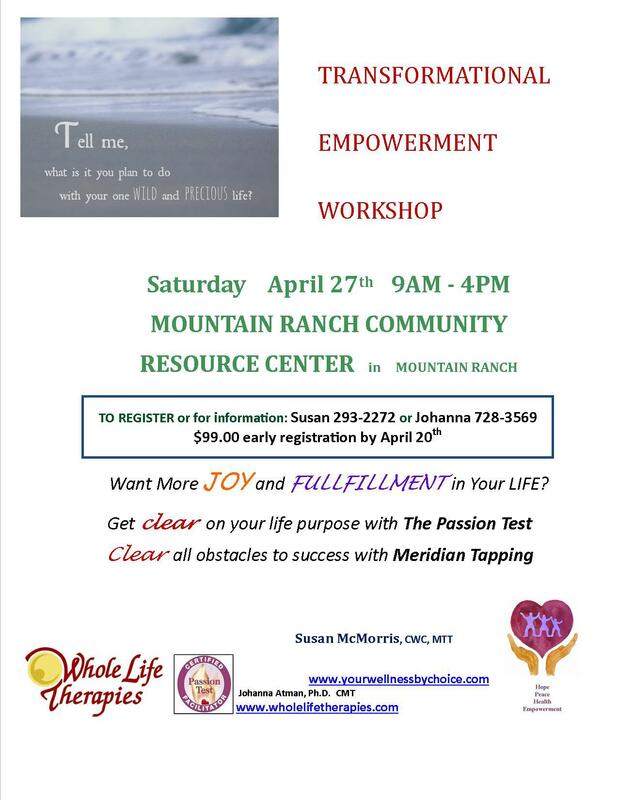 Susan McMorris facilitating her powerful “Empowerment for Women” workshop. The current session is completed. 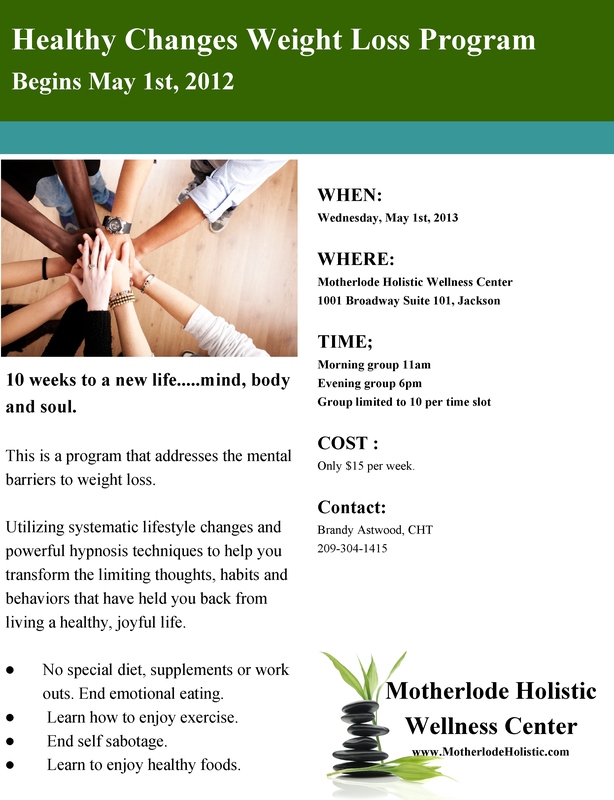 Registration for the next 8 week session beginning May 14th is now open . 209-401-6665 . Tuesday Yoga with Beverly Fisher. Small class for individual attention and training. 9:30 am to 10:30 and 12noon to 1pm. Perfect for a lunch break! Davinas Healing Hands, has 4 massage therapist on staff as well as 2 massage rooms to help you relax and heal. Evening and weekend appointment available. To schedule call the main office at 209-223-1497. SOBA Salon is now open and offering a fantastic services and products that are organic, botanical based. Not your regular run of the mill salon! This will be a shorter workshop because we do not want to fatigue anyone’s back. Due to the fact that this is a shorter workshop there will not be a booklet handout at the beginning. All attendees are encouraged to bring notebooks and cameras to help remember each exercise after the workshop is over. Join us for Reiki Classes at the Beautiful Health In Harmony Retreat. Starts April 20th through June 8th, Saturdays from 9:30am to 1:30pm – Light vegetarian meal will be served during break. See www.sacredsightintuitivehealing.com or call 209-304-7038 for more information. Unwind with yoga out under the sky, fully relax and release with guided mediation, learn self care massage and trigger point therapy, savor delicious wine, mindfully enjoy the taste of good food along other activities to build sisterhood and reduce stress of motherhood adventure. Cost $75 per mama. 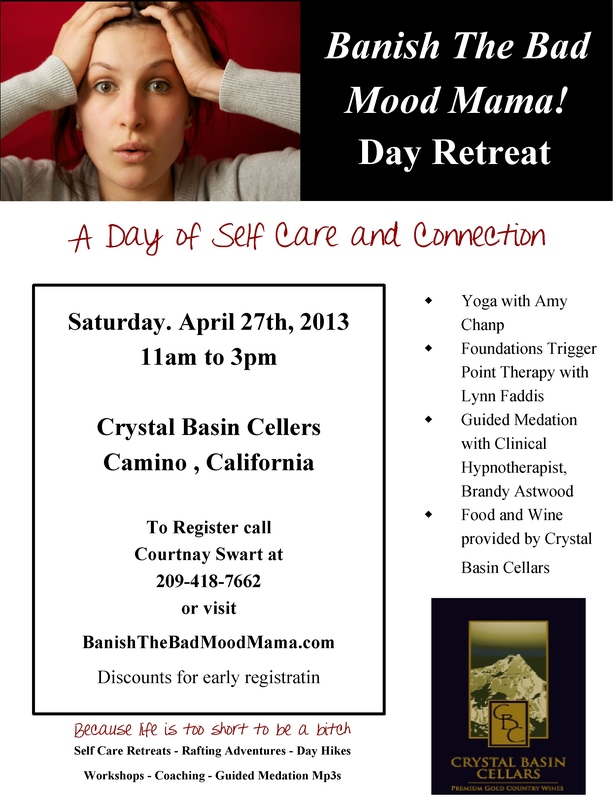 BanishTheBadMoodMama.com offers more information on upcoming workshops and events such as White Water Rafting Adventures , Day Hikes, and Self care Retreats. Come celebrate World Tai Chi and Qi Gong Day in Amador County! World Tai Chi and Qi Gong Day is an international celebrations where thousands of people, all over the world, come together at 10:00 in the morning to practice and learn Tai Chi and Qi Gong. During our 2013 celebration we will have several seminars and workshops available to offer a variety of information about these ancient Chinese arts to our community. Please come join us and feel free to bring as many people as you want. Everyone is welcome.